When he was a young man, Gene received an offer from a professional baseball team to become a player. Gene turned down the offer because it would have meant a fifty-dollar-a-month pay cut from his telegrapher's job. Take our favorite "Christmas Cowboy" with you everywhere you go! 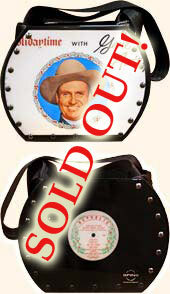 Seasonless and timeless, this unique handbag is made from an authentic Gene Autry Christmas record album, Holidaytime. One side of this shoulder bag features the original album cover featuring a photograph of Gene. The opposite side is the actual record album. Shoulder straps made of black seat belt material. Sure to be a collector's item! Display this original and unique item with your Gene Autry collection. It will easily stand up on its own. Each handbag comes with an additional original Holidaytime record album for your listening pleasure. This item is no longer available and sold out.